Once the startup begins scaling, leaders from each team start asking for more resources (e.g. we just signed 10 more customers, let’s hire another person to do ‘X’). Only, outside the budget, it’s difficult to assess the overall efficiency. One of the best metrics to track efficiency is revenue per employee. Over time, the revenue per employee changes as the startup scales from pre-revenue through to seed stage and beyond. Each milestone often has a higher revenue per employee with ones at the expansion stage typically having $200,000 or more in revenue per employee. Entrepreneurs would do well to track their own revenue per employee and benchmark it against other startups of similar size and scale. What else? What are some more thoughts on using revenue per employee to evaluate the efficiency of the startup? As the startup grows from a small group of co-founders to the first early employees and beyond, organizational accountability needs to scale as well. Co-founders, talking so frequently and being self-starters, often mind-meld on a daily basis and don’t need as much structure. Only, that doesn’t scale. Simplified One Page Strategic Plan – Get everyone on the same page. Keep it simple and current. Google Sheet KPIs Dashboard – Make the metrics transparent and open. Daily Check-ins – Spend 10 minutes aligning the team daily. Weekly Tactical Meetings – Review the strategic plan weekly. Quarterly Check-ins – Run the performance review quarterly. Accountability in a startup takes work. Make it a system with the right rhythm, data, and priorities. What else? What are some more thoughts on accountability in a startup? 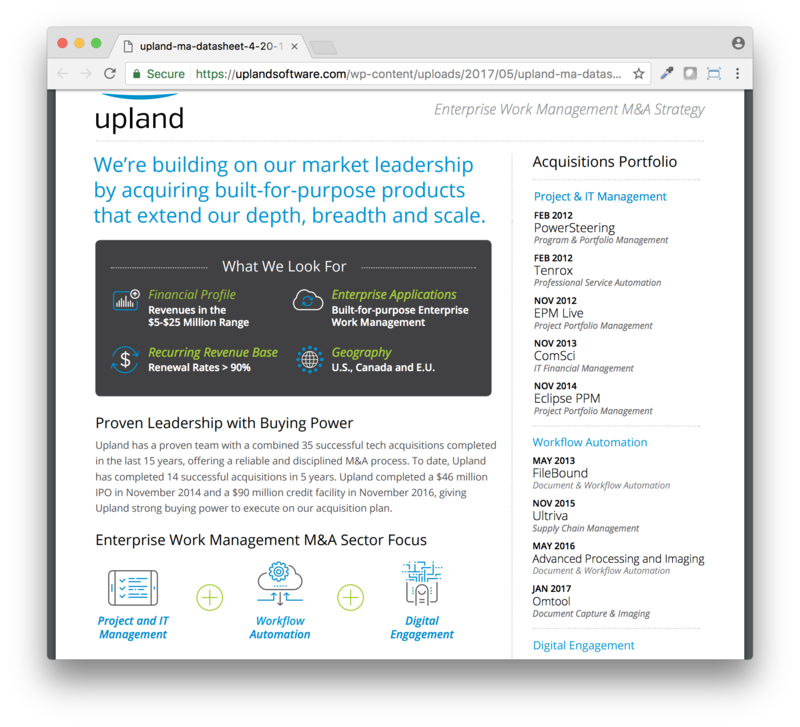 Upland Software is a publicly-traded SaaS company based in Austin, TX that specializes in acquiring sub-scale SaaS companies and rolling them into the portfolio. To date, they’ve acquired 14 companies and are actively looking to buy more. With a market cap of $480 million and an annualized run-rate of $80 million (source UPLD), they’ve executed this strategy for 7+ years. Geography – U.S., Canada and E.U. The acquisition is within Upland’s target range of 5-8x pro forma Adjusted EBITDA and will be immediately accretive to Upland’s Adjusted EBITDA per share. Long term, their target is an Adjusted EBITDA margin of 40%. Entrepreneurs thinking through potential exit value for their startup should understand these values and how a financial buyer might value the business. What else? What are some more thoughts on this example with four criteria for a 5-8x Adjusted EBITDA software exit? Simplified One Page Strategic Plan – The one pager is the overall business alignment doc. Priorities change every quarter, along with the basic metrics, but much of the document stays the same. Quarterly Check-ins – Whether it’s monthly or quarterly check-ins, it’s critical to spend time with team members and constantly calibrate. With small startups, it’s more ad hoc and formalizes as the business grows. Monthly SaaS Metrics – While the one pager has great high-level info, the monthly SaaS metrics sheet breaks it down into dozens of data points and provides a fine-grained view into the performance of the business. Start, Stop, Continue – What’s working well, not working, and needs to change in the business? Just like a scrum meeting, it’s important to evaluate the overall business functions as well. Figure out what’s right for the startup and continuously evolve the rhythm, data, and priorities. What else? What are some more ideas to wrap up each quarter? Whenever I meet with an entrepreneur that’s raising money I ask about current funding, burn rate, and the number of months of runway. Managing cash, and understanding the corresponding business unit economics, are two critical functions of an entrepreneur, yet many don’t do it. In fact, ensuring that there’s always enough cash in the bank is one of the three most important things a CEO does. How much cash do we have? How much cash are we burning each month? How many months do we have until we run out of money? Pretty simple, right? Only, many entrepreneurs I talk to can’t answer these three questions with confidence. Entrepreneurs need to understand the importance of cash and manage it accordingly. What else? What are some more thoughts on the three simple monthly cash questions? Once a startup has product/market fit, one of the best things they can do is a Simplified One Page Strategic Plan and update it on a quarterly basis. The concept is easy: put the most important high-level things about the business on one side of one sheet of paper and ensure everyone in the organization understands all aspects of it. Nothing more, nothing less — make it a simple doc. Entrepreneurs would do well to implement the Simplified One Page Strategic Plan (Google Doc template, example plan) and update it on a quarterly basis. What else? What are some more thoughts on the Quarterly Simplified One Page Strategic Plan?